Don't get wrapped up in the AT&T and DIRECTV merger. Switch to Sprint and get your first 12 months of wireless service FREE. Need more data? Get 4 GB/line for $10/mo. or 6 GB/line for $20/mo. extra. *Plus any additional data beyond 2 GB. Or you may choose to change to any current plan. Stuck with your carrier? Not anymore. Sprint will pay off your old phone and contract so you can switch. It's that easy. Via an American Express® Reward Card after online registration and phone turn in. Reg./line/mo. and fees by area (approx. 5–20%)]. Surcharges are not taxes. See sprint.com/taxesandfees. Offer Ends 11/19/15. Activ. Fee: $36/line. Credit approval required. Plan: Req. active DIRECTV account. Includes 12 consecutive months of service with unlimited domestic calling and texting. Data allowance includes 2GB per line of on-network data with 100MB off-network data usage. Add'l on-network data usage: 1.5¢/MB. Mobile Hotspot Usage pulls from your data allowances. Third-party content/downloads are add'l charge. Int'l svcs are not included. Max of 5 phone lines. Must remain in good-standing. You must contact Sprint customer svc & cancel svc within 30 days of end of free service to avoid rate plan charges . Not available on discounted phone purchase or add'l $25 fee line/mo. applies Bills: Must upload online and not be older than 60 days. Name and address must match. Sprint, in its sole discretion, has the right to deny offer for any bill that appears altered or fraudulent. Usage Limitations: To improve data experience for the majority of users, throughput may be limited, varied or reduced on the network. Sprint may terminate service if off-network roaming usage in a month exceeds: (1) 800 min. or a majority of min. ; or (2) 100MB or a majority of KB. Prohibited network use rules apply—see sprint.com/termsandconditions. Early termination of service on Sprint Easy Pay/lease: Remaining payments will be due immediately. Lease also req.device return or payment of purchase option device price in lease. Contract Buy Out Offer: Amount based on ETF (early termination fee) charged or remaining phone balance. Req. active wireless phone line port from other carrier to Sprint; remain active; in good standing & turn in of working phone tied to phone balance/ETF submitted or be charged up to amount of the Reward Card . Register & submit final bill w/ ETF or phone balance within 60 days of switching at sprint.com/joinsprint. Allow 15 days after registration approval for Reward Card arrival. Excludes discounted phones, 100+ Corporate-liable, prepaid & ports made between Sprint or related entities. Reward Card: Terms & conditions apply to Reward Cards. 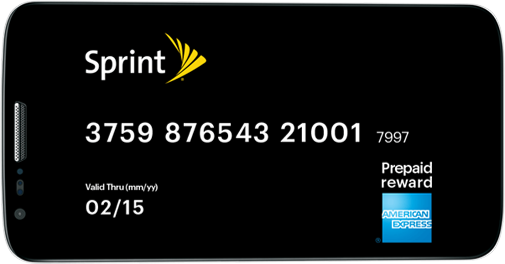 See Cardholder Agreement or visit www.americanexpress.com/sprint for details. Subject to applicable law, a $3/mo. service fee applies beginning in the 7th month after Card issuance. Card is issued by American Express Prepaid Card Management Corporation. American Express is not the sponsor of this promotion. Sprint Buyback: Limit of 5 returned devices per active mobile number during one 12 month period, 3 per transaction. Phone must be deactivated & all personal data deleted before recycling. Device will not be returned. Credit varies depending on phone condition and valuation. Credit applied to store purchase or account within 3 invoices. Also available at sprintbuyback.com. Other Terms: Offers and coverage not available everywhere or for all phones/networks. See sprint.com/coverage for details. May not be combined with other offers. Restrictions apply. See store or sprint.com for details. © 2015 Sprint. All rights reserved. Other marks are the property of their respective owners.